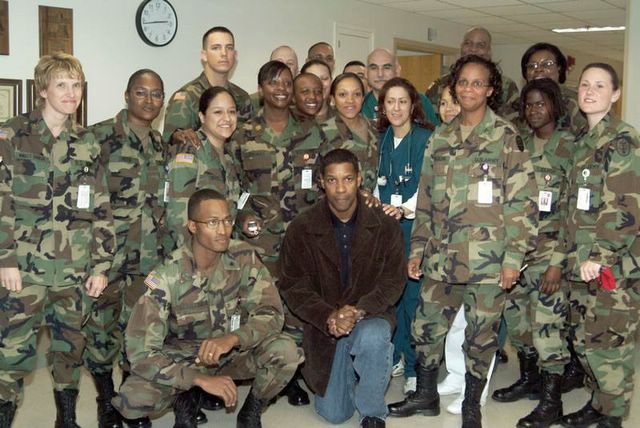 In this past year, Denzel Washington took some time out to thank the troops. This week he thanked them again. Denzel Washington was visiting BAMC (Brooke Army Medical Center, in San Antonio,Texas) the other day (in December). This is where soldiers that have been evac’d from Germany come to be hospitalized in the States, especially burn victims. They have buildings there called Fisher Houses. The Fisher House is a hotel where soldiers’ families can stay, for little or no charge, while their soldier is staying in the hospital. BAMC has quite a few of these houses on base but as you can imagine, they are almost completely filled most of the time. While Denzel Washington was visiting BAMC, they gave him a tour of one of the Fisher Houses. He asked how much one of them would cost to build. Stupid liberals. So that’s why this story was relegated to the obscure world of widespread e-mail dissemination. “He came over and spent some time at the Fisher House,” says Fisher House Foundation spokesman Jim Weiskopf. “He and his wife were very impressed with what they saw, and in fact he and his wife have pledged to make a substantial donation to us, but he did not whip out his checkbook and write a check on the spot.” The check’s in the mail, maybe, but not the check that’s in the e-mail. Well, this week Denzel Washington came through on his promise. And, while the Fisher House is not allowed to disclose the exact amount… it is sizeable! Months after visiting a military hospital and promising to help families of wounded U.S. soldiers, actor Denzel Washington has come through in a big way. Washington gave one of the biggest donations ever made to Fisher House Foundation Inc., which operates guest facilities for families with loved ones recuperating in military hospitals, an official at the nonprofit said Wednesday. “Denzel and his wife, Pauletta, did send us a check with their donation,” said James Weiskopf of Rockville, Md., the foundation’s vice president for communications. “While we do not disclose the amount of a donation without approval from the donor, we can acknowledge that it is one of the most significant received in our history,” Weiskopf said. Just something to remember next time you’re at the movies! Hat Tip to Navy Specialist Sha’ron Evans, YN2(VS22) on the USS Harry S. Truman for originally sending me this email. And, thank you to all of those serving in our armed forces. Be safe! Update 2: The Powerline Men have linked to this news about this American Superstar who is keeping it real!